It’s been a long year. We started our house remodeling project about at this time last year, and it’s been an incredibly slow process. Both Dave and I work full time, and with my blog and our personal commitments, it’s very difficult to find the time to find the time to furniture shop, decorate, and plan our projects. Plus, after a long day of work it’s hard to be motivated to get on it. We have a little kick in the pants now with Christmas coming – I really want us to be able to host Christmas Brunch at our house, and to do that, we need to have the living room done. For us, though, the priority has been the office and bedroom (for obvious reasons.) We formerly had a roommate (Dave’s brother), so this office space is completely new to us. We started with white walls and carpet… and now it looks completely different. You’ve seen my desk space, but I thought it was time to reveal the (nearly) complete DIY makeup vanity and storage area I’ve been working on! (Or if you would like to be like Dave, you can call this my Lady Palace. Oh men…) If you’re planning on creating a vanity of your own soon, I’ve broken down the furniture pieces I’ve purchased, and some of the storage solutions that have worked for me and that I’m happy with, so far anyway! I wanted to maximize the space and storage area in my vanity area, so I started by selecting a desk (the IKEA Micke) and opting for a magnified makeup mirror over a mounted mirror. There are a couple reasons for this. The first reason is that our condo doesn’t get a lot of natural light, so I need something that is bright all year round. The second is because I like to get really close to the mirror and didn’t think I’d like one that was closer to the wall. I definitely like this set up (I ended up with the Zadro Lighted Makeup Mirror if you’re curious) and don’t miss having a larger mirror at all. I missed getting my seating in these shots, but I normally sit at my Frosta Stool, also from IKEA. I went with the bright yellow-green color, and it adds a lively pop to my otherwise white set up. It’s not super comfortable for many hours of sitting, but I don’t mind it for an hour or two at a time. This desk has plenty of space in the main desk drawer for the products I use most often, and it’s complimented by the IKEA Alex 9 Drawer Unit which stores hides my makeup, skincare, and nail polish collection. Yes, collection. I have an illness. If you think it’s strange I have a phone on a shelf on the wall and think I’m trying to start some new blogger trend; I promise I’m not. ;) The phone belonged to my grandma, and for me it represents a lot of memories I have with her, talking on the phone late into the night. My grandma was notoriously chatty, and we always joked that if we got on the phone with her, plan for at least an hour. She was a storyteller – she loved to talk about her life on the farm as a child, some of the difficult experiences she lived through, and the early years of her and my grandpa’s relationship. Next to the phone I framed a favorite photo I found of her when we were going through old albums after she passed away. The photo is of her getting ready at her makeup vanity. How appropriate. I also have several illustrations from Garance Dore’s collaboration with Rifle Paper Co. I’ve always loved fashion illustrations, and the classic styles represented in these illustrations are perfect. 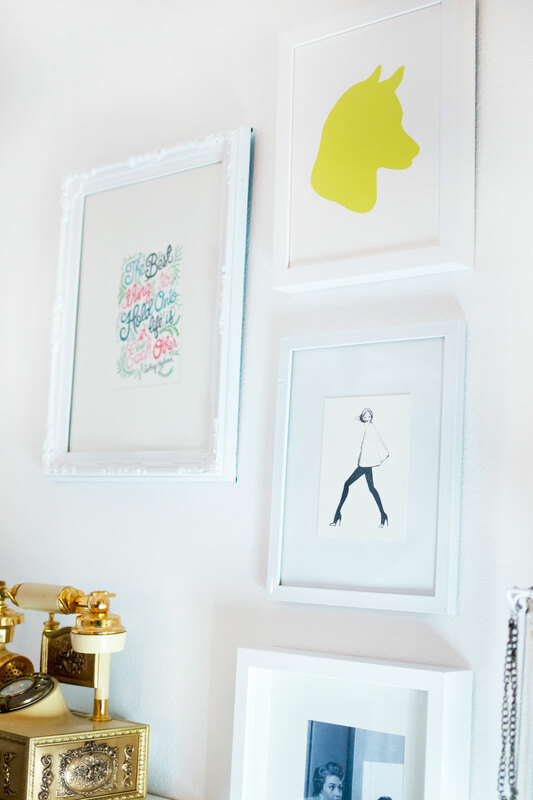 These are actually from a notecard set and framed in inexpensive frames from Target. I also picked up the calendar for 2016 which features even more illustrations at a larger size, which I will probably frame at the end of next year! To the left of that, on the side wall, is a piece I made professing my love for Seattle. I found a vintage map of the State of Washington and made the rest in Photoshop. It was super simple to make and saved me from having to buy a similar design on Etsy. The final piece on the wall that I haven’t mentioned is above my jewelry and perfume storage. It’s an oval with SJP embossed on it. Any guesses? It’s for Sarah Jessica Parker’s shoe line, and is signed by her! I met her when she came to Seattle for the launch of SJP a couple years back. The shoes I purchased from her line remain one of my all-time favorites, and I love this little reminder of that day. My jewelry box was a gift from Dave’s brother (okay, technically he gave me a Target gift card, but he approved of the purchase so whatever.) Considering I think I paid $20, I think it was a great buy. (This jewelry box at Target looks identical and is in the same price range.) I had a hard time finding something that looked nice that wasn’t $100 or so. On top of my jewelry box is an acrylic tray I also found at Target. My perfume collection is a little cramped, but I also have some travel/deluxe sample sizes mixed in. Ironically, I only wear one or two perfumes, and my scent of choice is Cartier Baiser de Vole Essence de Parfu, in case you were curious. My less expensive costume jewelry (necklaces, earrings, bracelets) are hanging on a birdcage jewelry rack that I found at Urban Outfitters a few years ago. They have other similar jewelry storage solutions, and I highly recommend checking them out based on my experiences with this one. It can hold quite a bit of weight as I used to also have my perfume on this before it outgrew the shelf space. Phew! That was a lot of stuff to cover, but it took a lot of time and effort to find each of these pieces and make sure they would be right for the space. 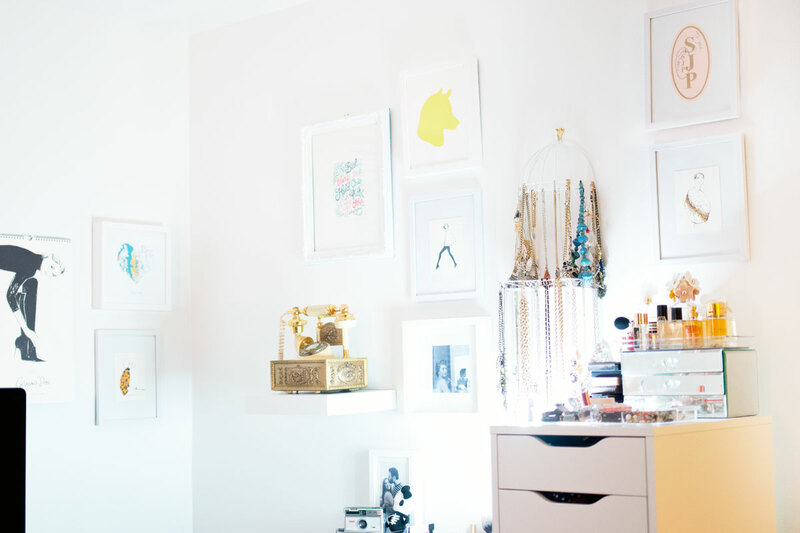 Hopefully, it is or will be helpful if you ever find yourself working on the same type of space! 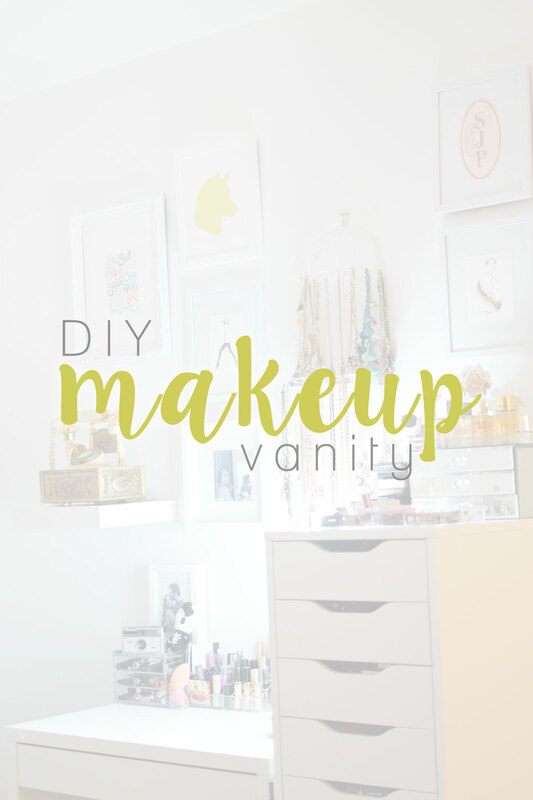 Have you created a makeup vanity or beauty corner in your house? What are some things that make your space unique and special to you? Jenn! I absolutely love your “Lady Palace”! It’s total perfection!! 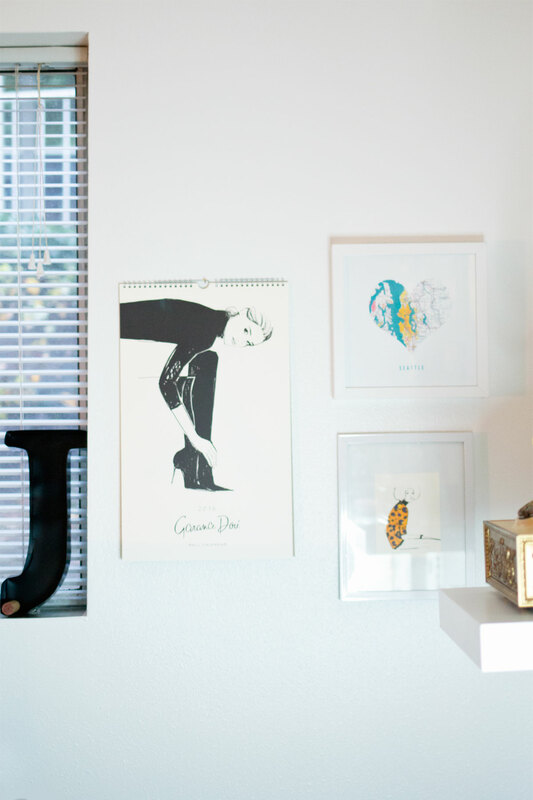 I loved this little sneak peek into your home! Dude, the phone is my favorite. And the birdcage jewelry folder! My cat would have a field day with that, but it’s so pretty. 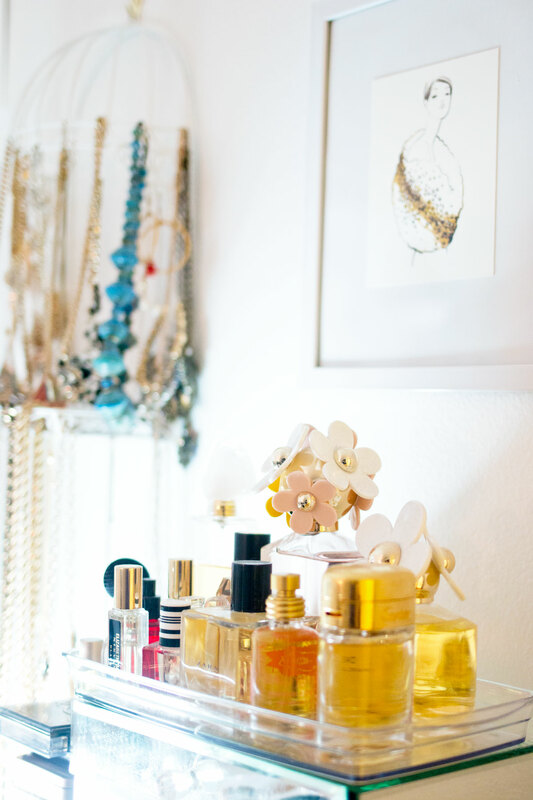 I’m still looking for a jewelry storage option that works for me. Either all my jewelry gets mixed and stuck together or I just can’t see it clearly or it’s too out in the open for my cat to be tempted to knock it down or all of the above. Haha, I bet your cat would! 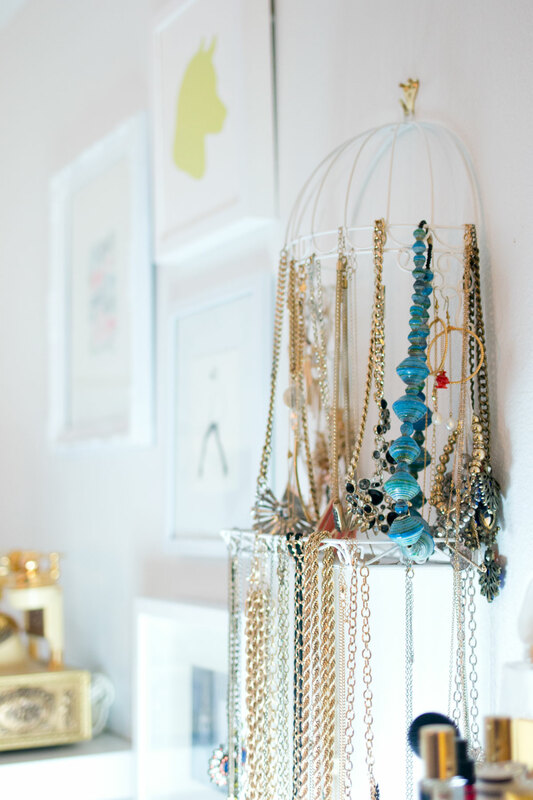 I definitely had the same issue with jewelry, but having them hung up on the wall definitely is helpful. I use trays and bowls for smaller pieces which makes it easier to get a visual of what I have! I just bought my daughter the Ikea Alexa drawer unit for her desk last week! I love it! Ikea is uh-mazing! Love the vanity! 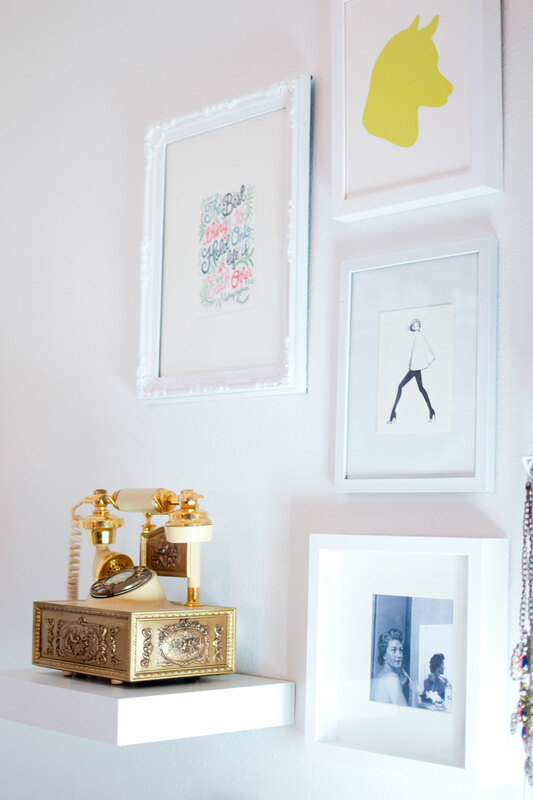 Ikea is one of our favorite places to get furniture, especially the practical storage-y kind! Thanks Portia! Loved getting a tour of your space! I can’t wait until we buy a house and I can have a beauty room! I need all the Alex drawers from IKEA; my little plastic ones are bursting at the seams! The Alex Drawers are so nice! I kind of need another one (eek!) but I’m just trying to downsize instead.